Who says you need to serve beef and poultry during the holidays? 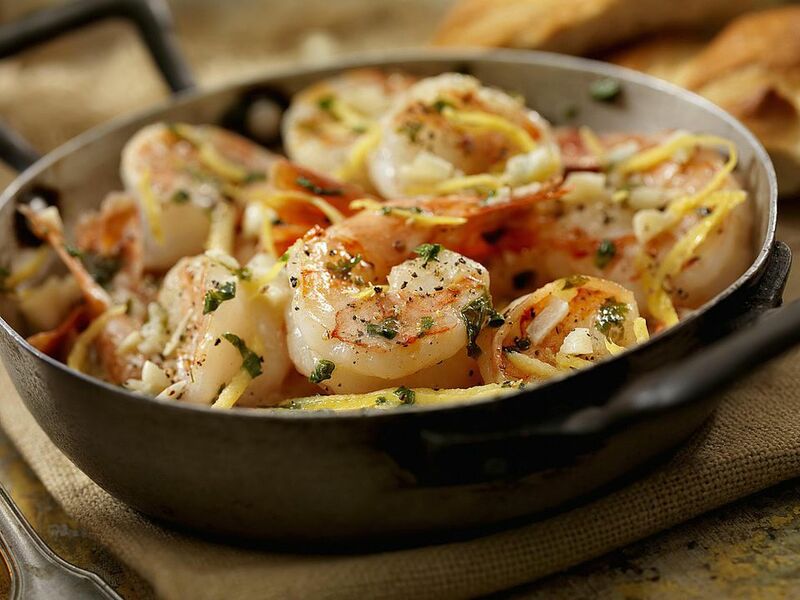 This elegant dinner menu featuring shrimp scampi will become your absolute favorite for entertaining, whether it's a celebratory gathering or just the weekend. Although impressive in both taste and appearance, shrimp scampi is a simple dish to put together, taking less than 20 minutes. The rest of the menu complements the shrimp. The rice pilaf soaks up the wonderful lemony, garlicky butter, and garlic toast adds crunch and more buttery flavor. A crisp green salad and roasted asparagus balance out the rich entree and add freshness to the menu. Complete the meal with a dessert that is a showstopper: Chocolate macaroon bundt cake. Although there are several items on this menu, much can be made ahead. Bake the cake the day before your dinner party, and assemble the bread in the morning, along with the salad dressing. The pilaf and the shrimp have to be prepared just before serving, but they are simple and quick to put together. The centerpiece of your meal is a bit indulgent, but that's okay—it's the holidays! This is a classic recipe for shrimp scampi, where the shrimp are cooked in a delicious mixture of butter, oil, garlic, lemon juice, white wine, and parsley. You can serve as is or over pasta if you wish. If you can find fresh unfrozen shrimp (most shrimp is sold frozen), by all means, go for it. Just make sure they smell sweet and like the ocean. Defrost frozen shrimp in the fridge during the day of your party. This foolproof recipe will become a staple in your repertoire. The rice is first sauteed in butter and olive oil along with chopped onion before the hot broth is added. Because the broth is nearly at the boiling point, it shortens the cooking time and ensures that every grain absorbs the liquid. This recipe calls for thyme and marjoram, but feel free to use any herb you like. The bit of grated orange peel adds an unexpected brightness and a little color. Asparagus tastes best when prepared simply, and roasting brings out its sweetness and tender texture. This cooking method is best with thicker stalks, but if you only have thin asparagus just watch the oven carefully to make sure they don't get too dark and crispy. With just a hot oven, olive oil, and coarse salt, asparagus takes on a nutty, delicious flavor that complements almost any dish. Butter lettuce and frisee create the ideal base for the pears, walnuts, and blue cheese, and a dressing of oil, apple cider vinegar, sugar, and celery seed finish off the salad perfectly. Buy the pears a few days ahead and store them together at room temperature in a brown paper bag—it is best that the pears are soft for this elegant, sweet, and crunchy salad. 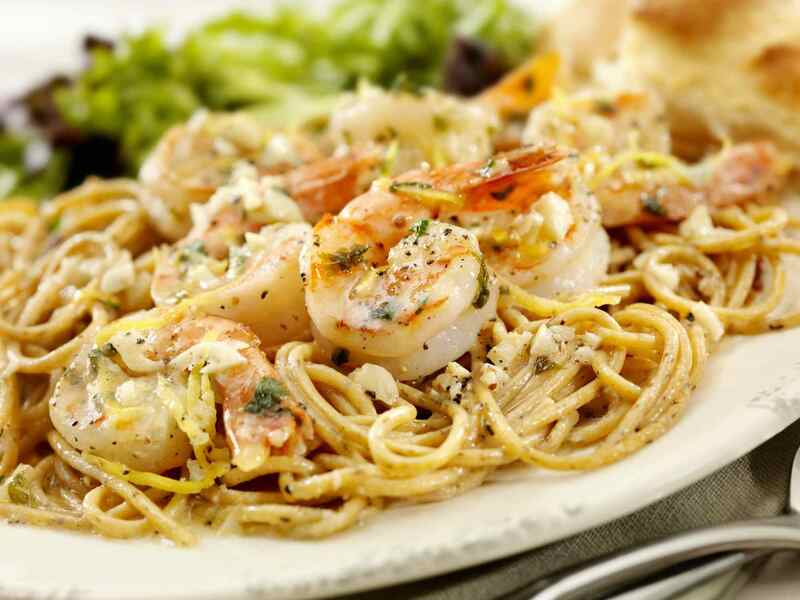 Garlic bread is the traditional accompaniment to shrimp scampi and is the best vehicle for sopping up the sauce. This recipe combines butter and olive oil (instead of just butter) for a depth of flavor not found in most garlic breads. Choose a hefty Italian bread or French baguette as you need a generous amount of soft crumb to absorb the butter and oil. This wonderful cake is the perfect finishing touch to this celebratory meal. It's big and gorgeous and has the most fabulous texture and flavor. Out of all of the recipes on this menu, this one will take the most time, but once baked (and tasted!) you will see that the effort is worth it. A chocolate sour cream batter is layered with coconut filling to create a bundt cake with a bit of a surprise inside. The finishing touch is the chocolate glaze that is spooned over the top.